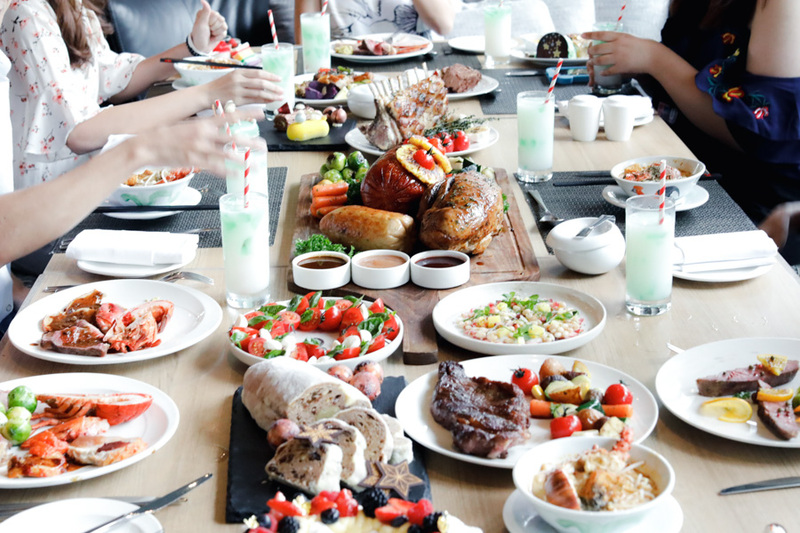 It is the time for festive celebrations and buffet dinners. Ever wondered how it feels to eat till you drop? Lime Restaurant at PARKROYAL on Pickering is indeed pulling out all the stops to “make this a place to celebrate your best Christmas ever”. And I don’t think they are kidding about it once you have seen the spread of food. 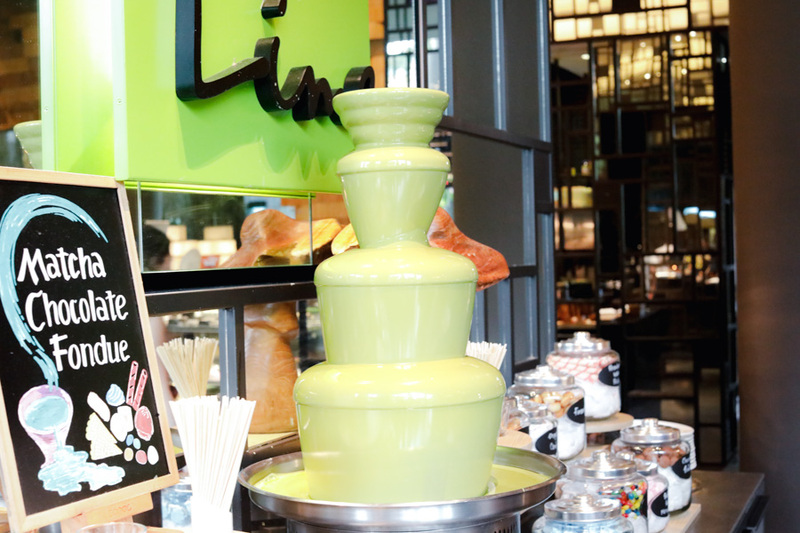 Not forgetting the famous Matcha Fountain and extensive dessert spread. 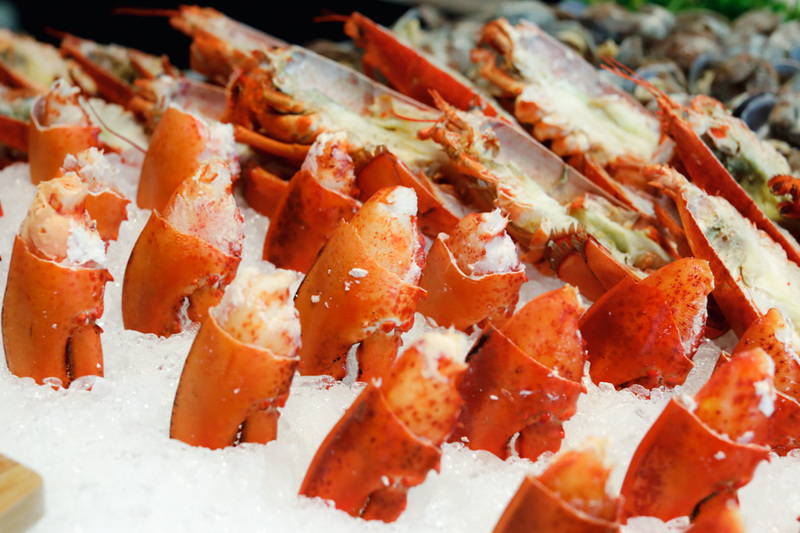 For seafood lovers dining on Christmas Eve and Christmas Day, you can also expect the freshest seafood from King Crab, Boston Lobster to freshly shucked Oysters. Diet. What diet? 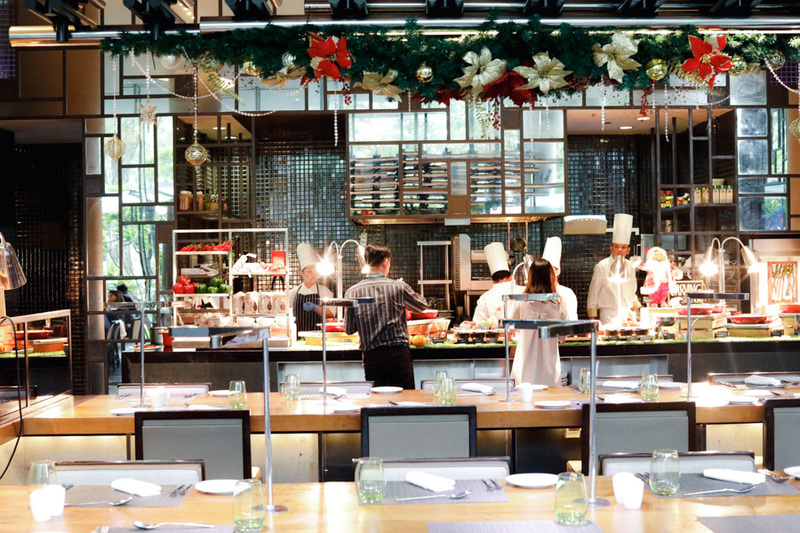 If you are heading over for the Festive Buffet, leave some room for Lime’s Signature Assam Fish, Coconut Curry Chicken, Lobster Laksa Noodles other than festive signatures. 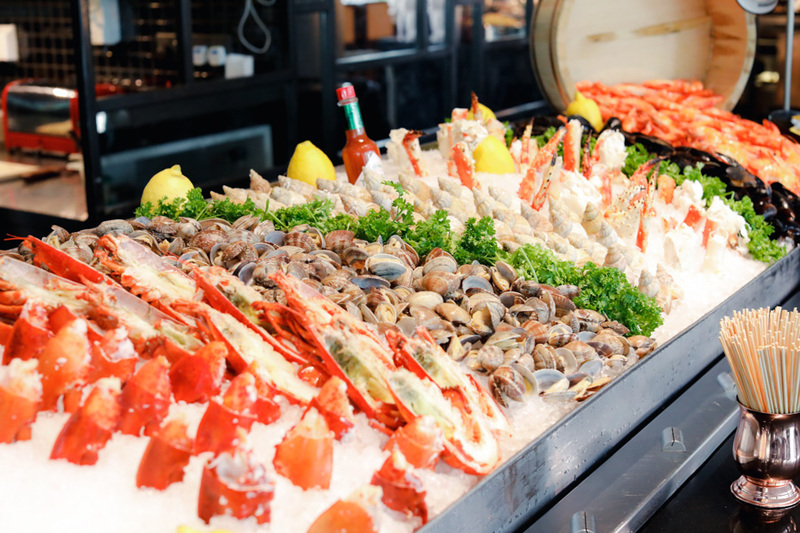 During dinner buffet time from the 1st of December, diners can expect a wide spread of food from King Crab, Boston Lobster, “Auntie Hakka” Deep Fried Pork, Pickering Carrot Cake, Tempura of Prawn and Vegetables, and Beef Rossini. This traditional Yuletide centrepiece is a deliciously roasted whole turkey with a golden-brown skin. 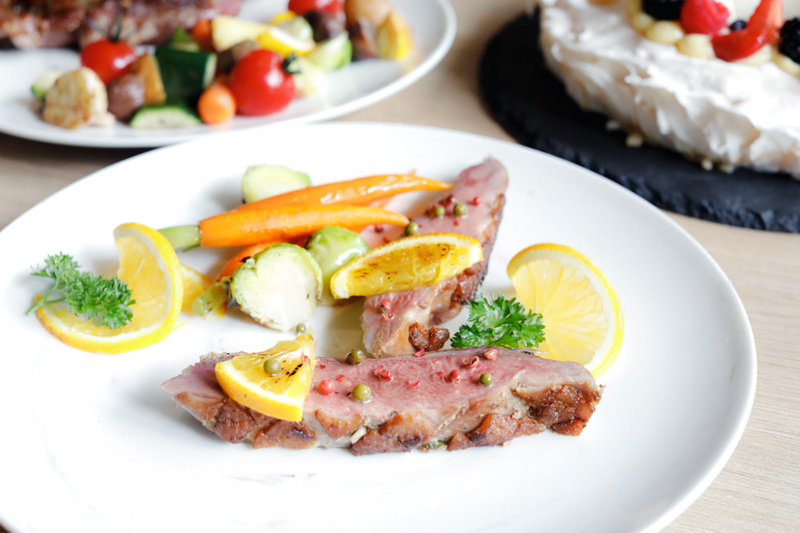 Its chestnut stuffing adds a nutty flavour to the subtle smoky notes of the meat. Served with roasted vegetables, chestnuts, pearl vine tomatoes, Brussel sprouts, roasted potatoes, and specialty sauces. 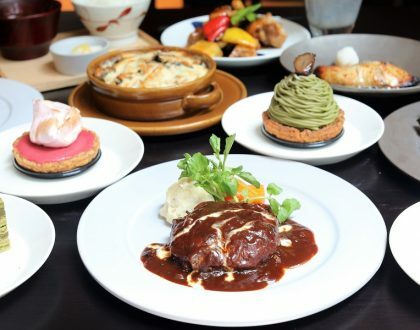 Available on rotational basis, you get a choice of the traditional roasted or the special creation of Sze Chuan Pepper Barbecue. Do not worry, it is NOT that spicy after all. To me, this is the REAL highlight. 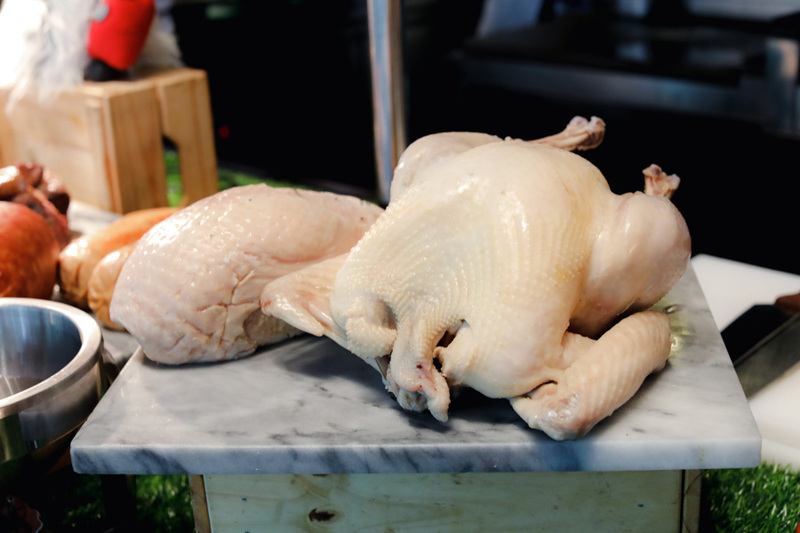 Let’s be real, some of us are not that much of a fan of turkeys due the meat can be quite dry. 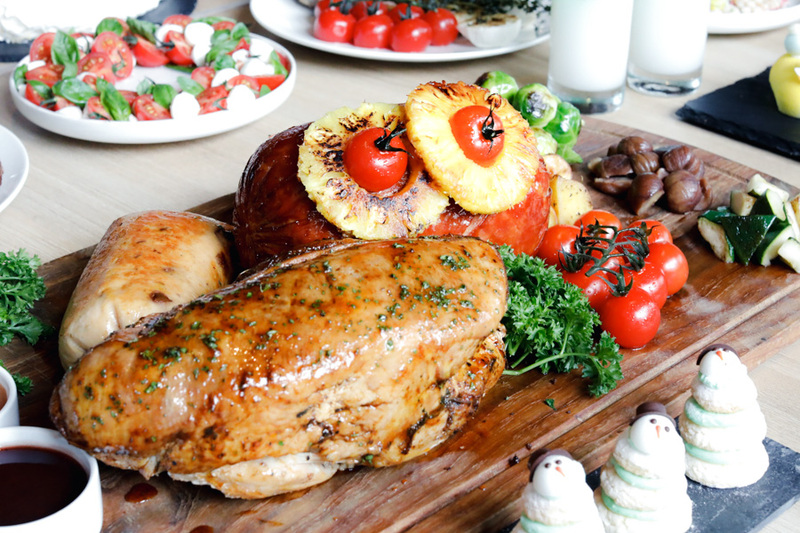 However, this Hainanese Poached Turkey – prepared in ways similar to our popular local dish, boosted of juicy, succulent meat. And you can add on other condiments such as the familiar signature chilli sauce with garlic. Worth a try. 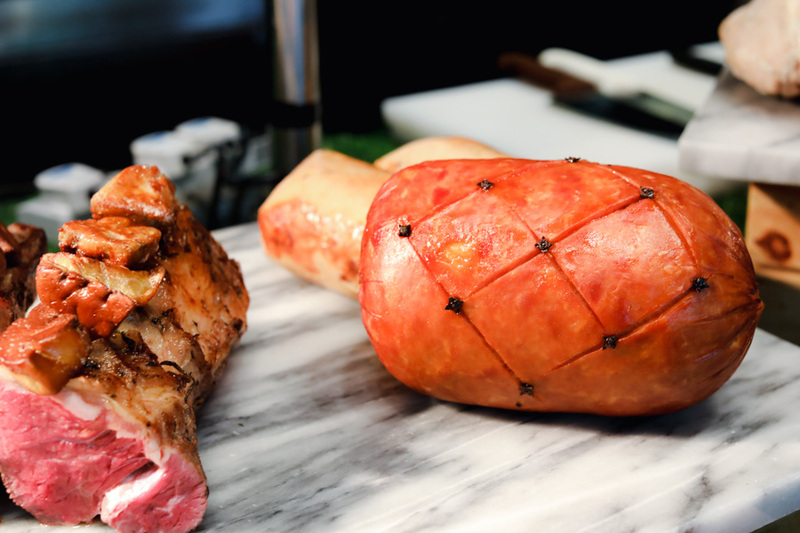 A ham that’s made with gammon, a type of cut from the hind leg of a pig ham, and slow roasted in a citrus bath with honey. The steaming allows the liquid to mingle with the meat, making it flavourful, then reduced to a honey citrus glaze for basting on the ham. Pair with some cranberry sauce to complete the piece. 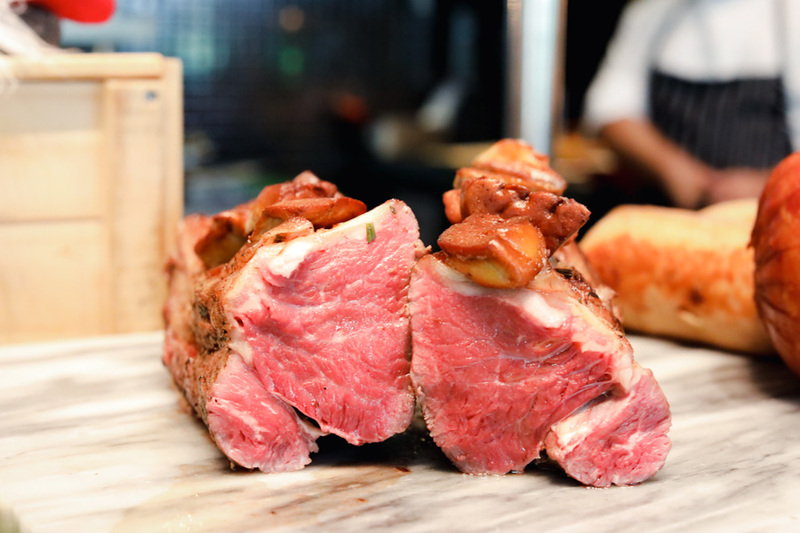 For the meat and protein lovers, this dish is inspired from Tournedos Rossini, a classic French steak dish where the fillet steak is served with a crouton and pan seared slice of foie gras, classically served with fresh truffle and a Madeira glaze. So yes, there are slices of smooth-buttery foie gras on the beef itself. Don’t miss them out! This roasted bone-in pork dish is seasoned and oven-baked shortly in high temperature to sear and seal the meat and lock in the juices. 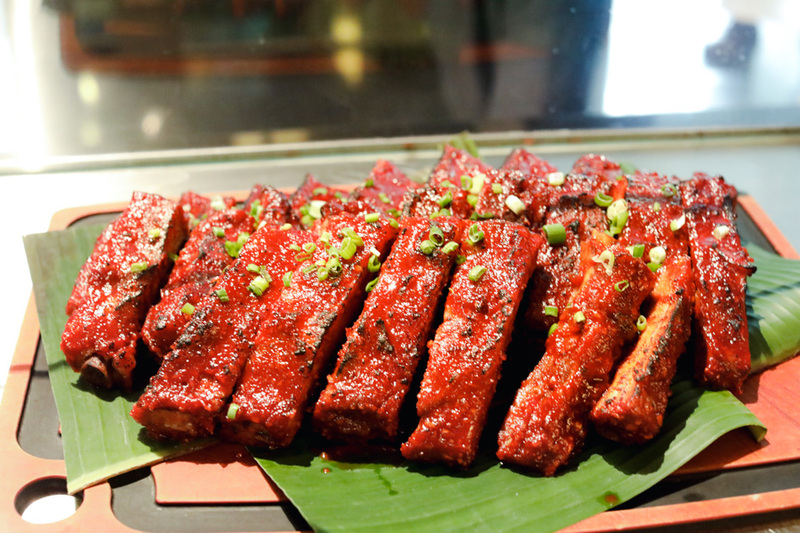 The ribs, brushed with spicy tomato paste, were fork-tender and worth a try. 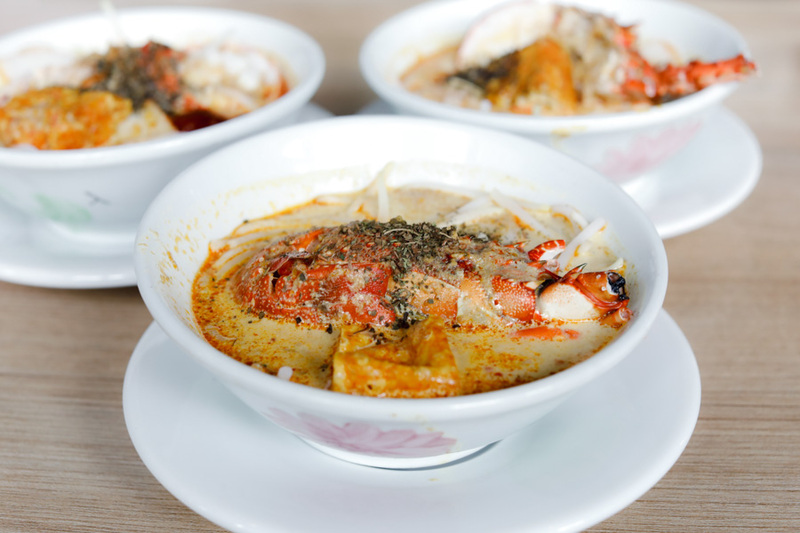 Choose from rice noodles, noodles or vermicelli, served in a spicy coconut-based soup, and topped with baby lobster. 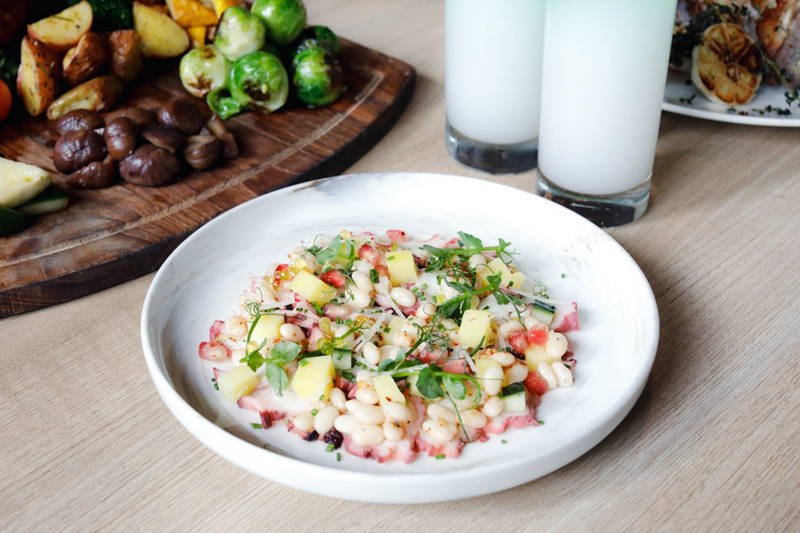 The baby lobsters add an element of ‘luxe’ and more flavours to the bowl. But what really sealed the deal was still the rich coconut gravy. This is from the cooked food section, in which there was a selection from Confit in Duck Fat and Herbs in Black Pepper Sauce; Grilled Marinated Chicken Leg with Spicy Barbecue Sauce; and Roasted Pork with Hot Chorizo and Cannellini Bean Ragout when I visited. 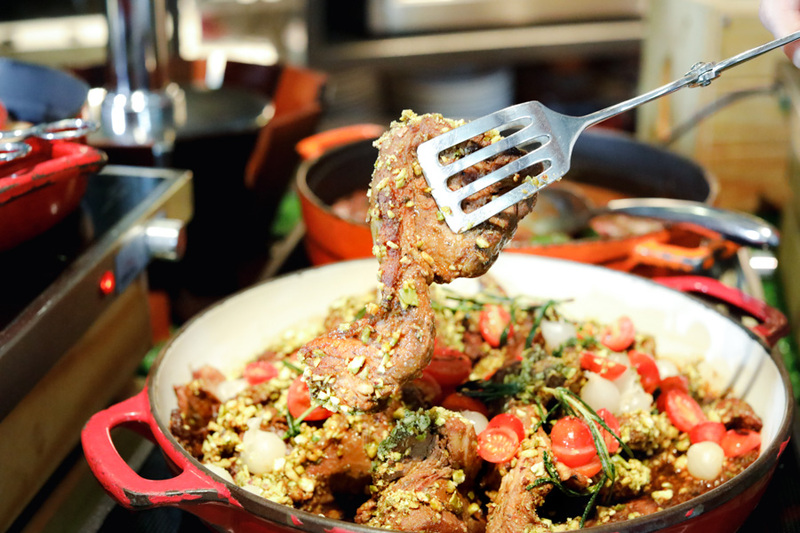 Enjoy the unique not-too-gamey taste of Lamb Chops, dusted with finely ground pistachios. The ground nuts serve as a crust to the steak or added texture and flavour. 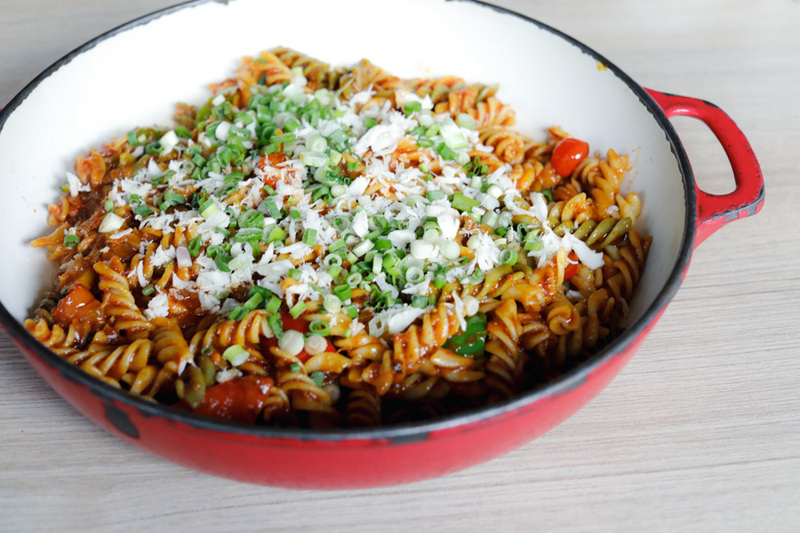 A special al dente pasta dish created just for the holidays, but still capturing that familiar Singaporean flavour. Served with a chili crab sauce, it is a zesty rich dish that combines the sweet taste of crab meat with the slight-fiery flavours of peppers. Actually quite delicious. Not just one, but four different logcakes to choose from – Blackforest, Belgium Dark Chocolate with Yuzu, Pandan & Coconut, and Durian Gula Melaka. 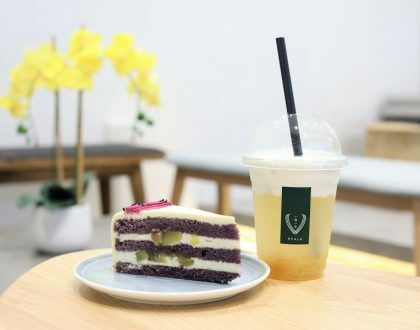 Fans of more local flavours would enjoy the soft and fragrant Pandan & Coconut; while it is hard for durian lovers to miss the Durian Gula Melaka. 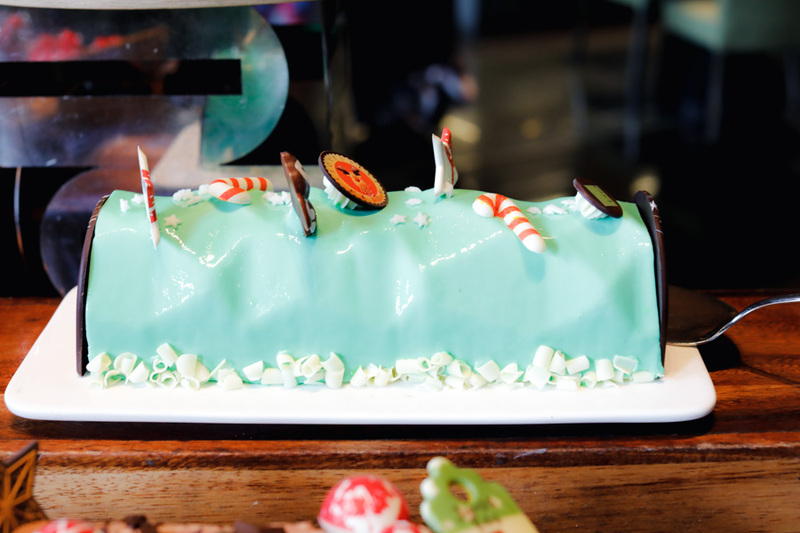 BUT, my own personal favourite had to be the new additional of Blackforest Yule Log. Oh, that smoothly-soft mousse texture with that bit of lingering alcohol. 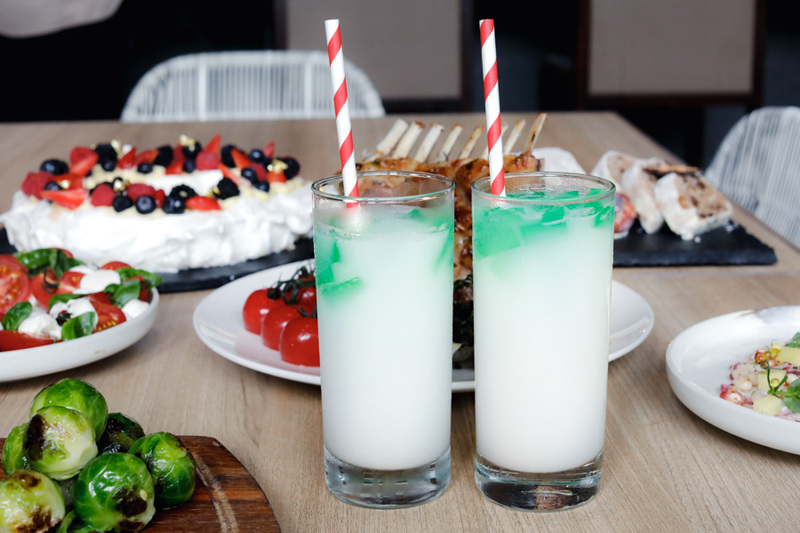 The drink adds an element of fun and playfulness, while the green perfectly matches the reds of the season. 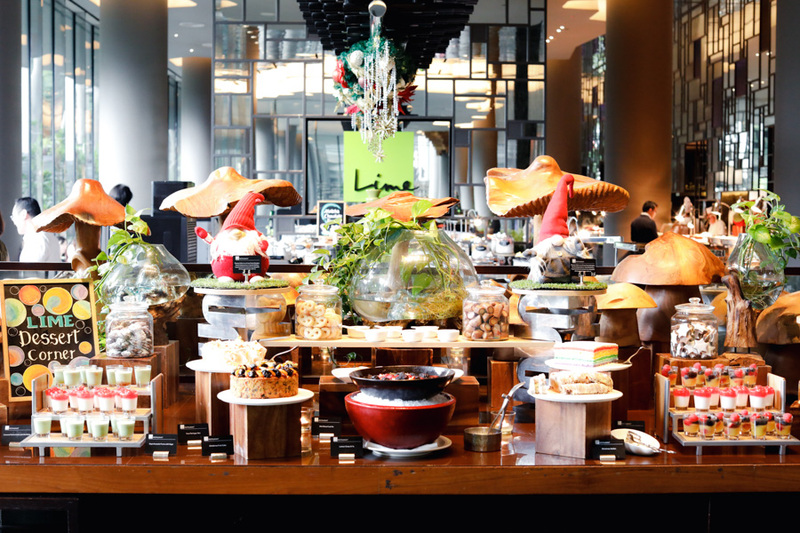 * UOB and DBS cardholders will enjoy 20% savings on Lime’s Festive Buffet, except on 24, 25 and 31 December 2018. Or pay with Mileslife and earn 8 miles per dollar (valid from 1 to 31 December 2018). 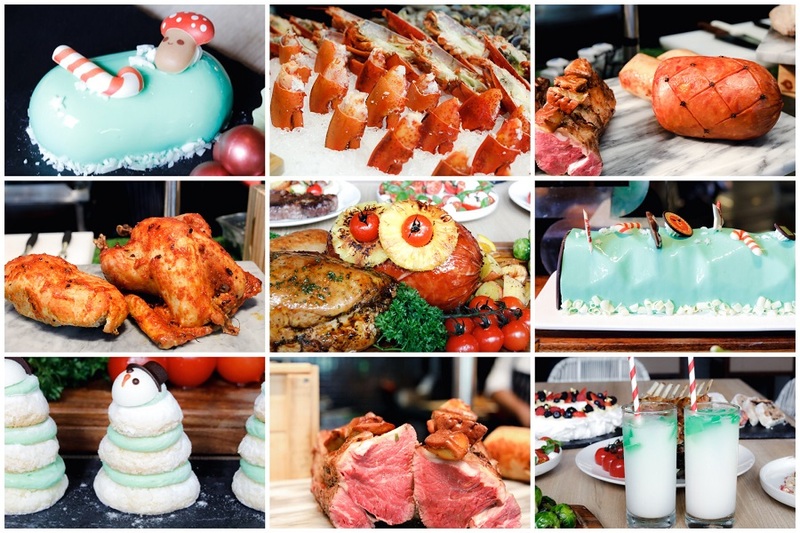 Joining the menu on the key dates for the extensive Festive Buffet include Pickering Herbal Dang Gui Roasted Duck, Roasted Beef Cheek with Juniper Berries Red Wine Jus & Red Pepper Corn, Baked Oyster in Chilli Sauce, Laska Pesto Fried Brown Rice with Honey Ham, and even Braised Pork Trotter. 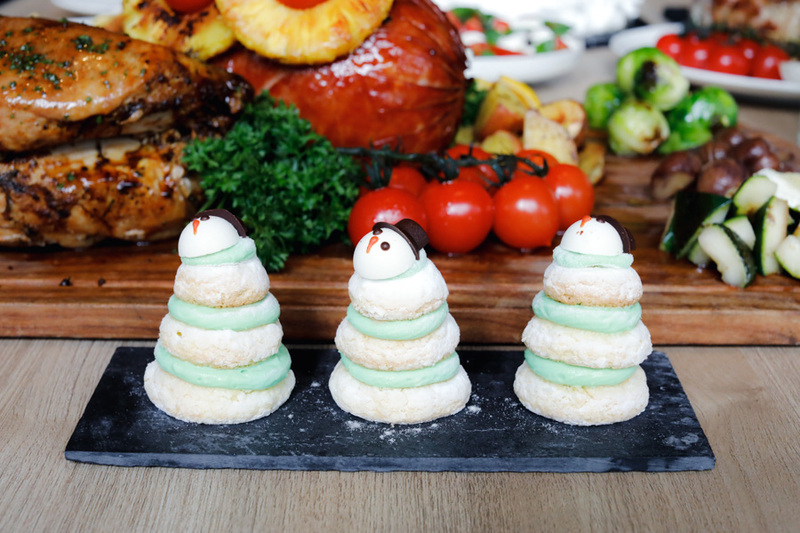 Making a special two-day appearance on the buffet line-up include the desserts of Christmas Pavlova, Yuletide Logs and Pannetone Pudding with Gingerbread Vanilla Sauce. There are also carollers performing live on both days, for diners to bask in the atmosphere. 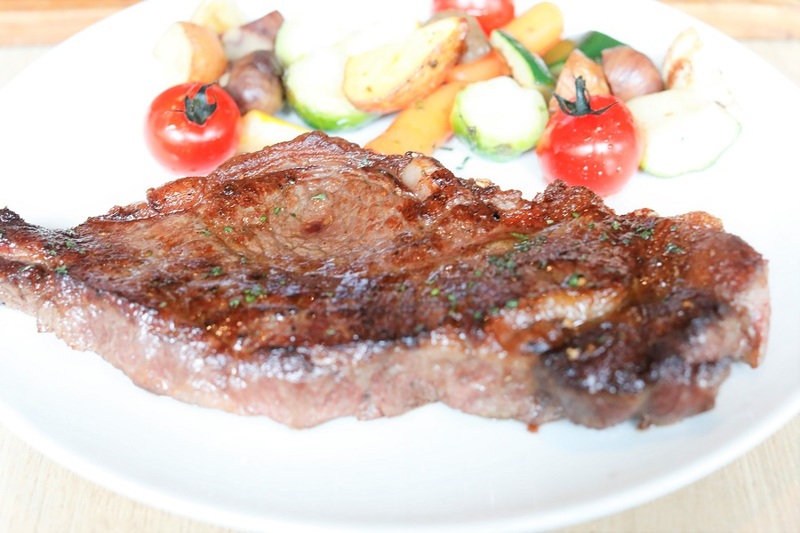 This premium steak cut comes from one of the more tender sections of the cow, right below the tenderloin. Prized for being lean but with fine, creamy marbling throughout, the Wagyu Beef Sirloin has great flavour and extra-tenderness. 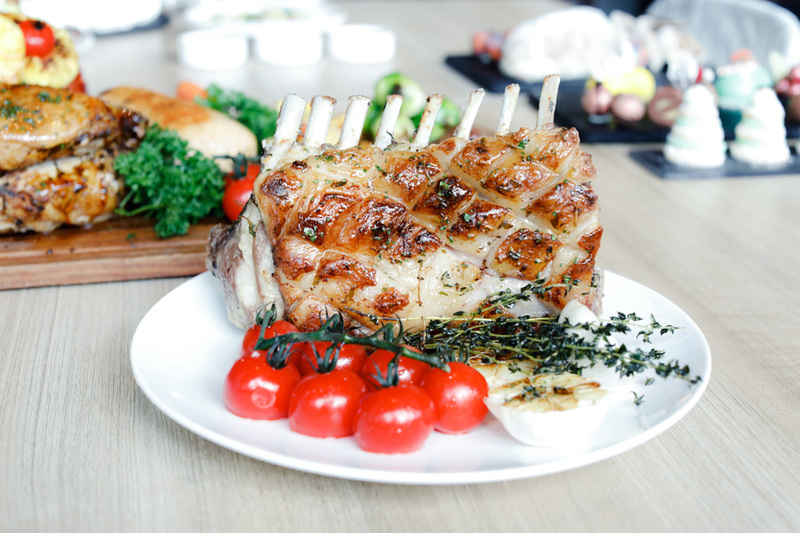 Sink your teeth into the distinct taste of lamb, specially marinated and made tender and moist because of the 12-hour slow roasting. This cooking process helps break down some of the tougher parts of the meat, until it comes out of the oven fork tender. A great main course for celebratory meals, the duck breast is crusted with roughly ground black peppercorns and thyme to impart a spicy herbal flavour to the meat. 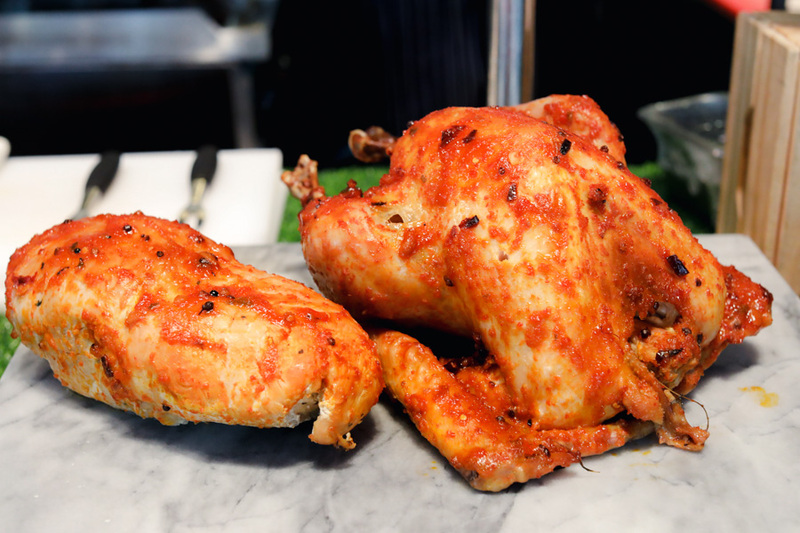 It is roasted in the oven until cooked, with its juices combined with orange juice to create the gravy. 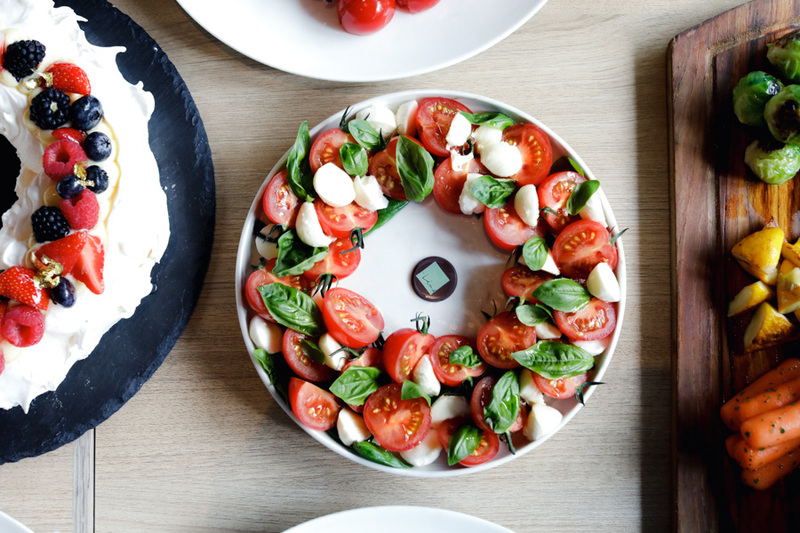 The rind-less, buttery-flavoured cheese, with is refreshingly delicate and creamy aroma, is best savoured as a salad for its springy texture and consistency. Octopus is cooked slowly over low heat to make it tender, and cut into small bite-sized pieces. 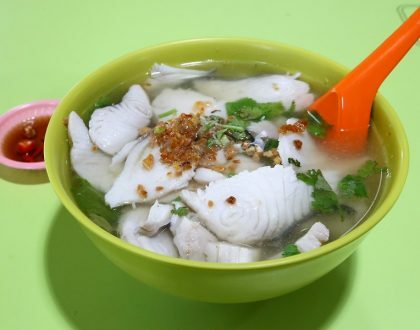 It is blended with boiled beans and chunks of potato, to add creaminess to the salad. Finished off by tossing all the ingredients in a slight-spicy dressing. A holiday version of the classic Pavlova, a meringue-based dessert with a crisp crust and soft, light interior, this dessert is often topped with fruits and whipped cream. 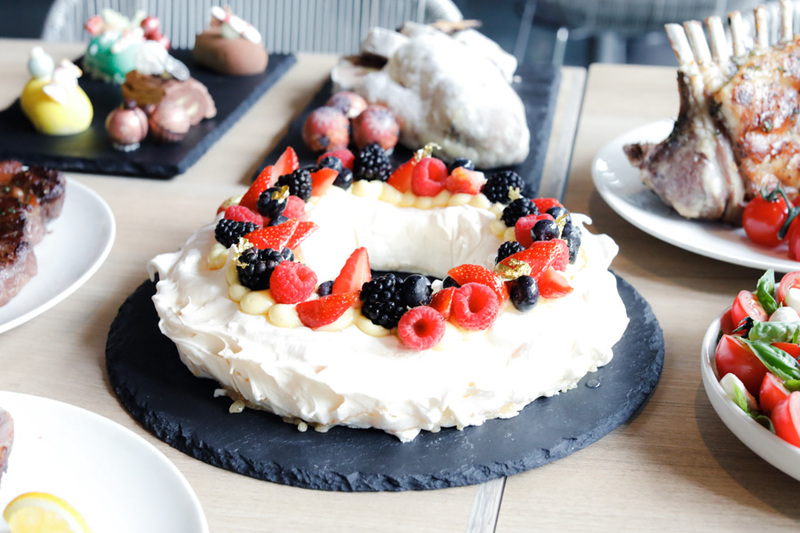 Instead of the usual round shape, the Pavlova is formed and baked as a ring to replicate a wreath, topped with fruits in Christmas colours. 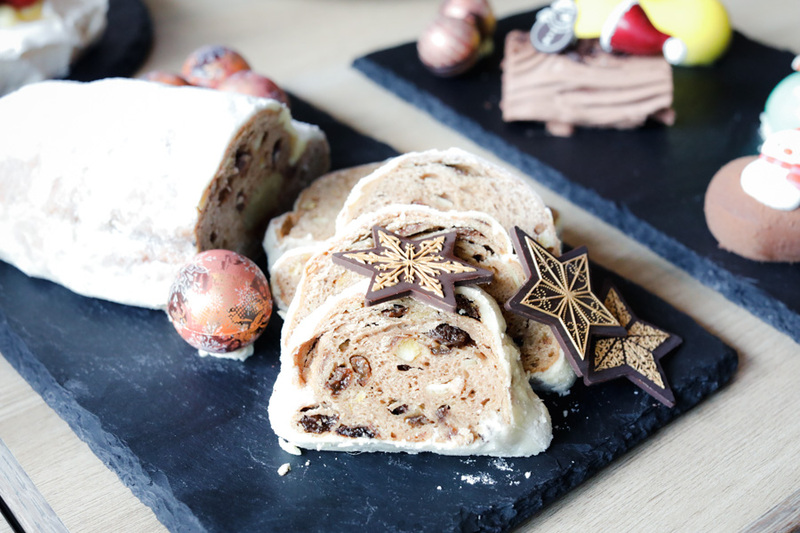 Fruit bread baked with dried and candied fruits, spices, and nuts, then coated with powdered or icing sugar for that snowy effect. 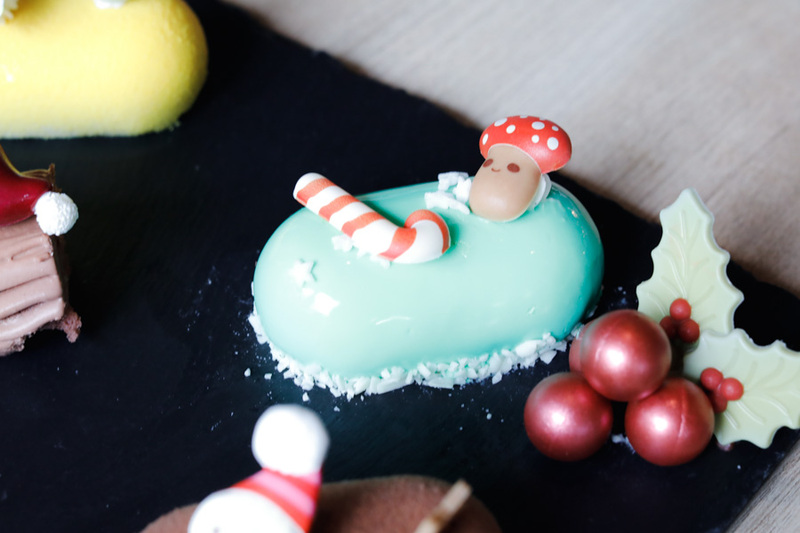 These butter cookies, known as sablé to the French, made with chestnut cream and decorated to match the Christmas mood. Very cute. If you are hosting a celebration party, then the fuss-free Celebration Set will come in very handy. 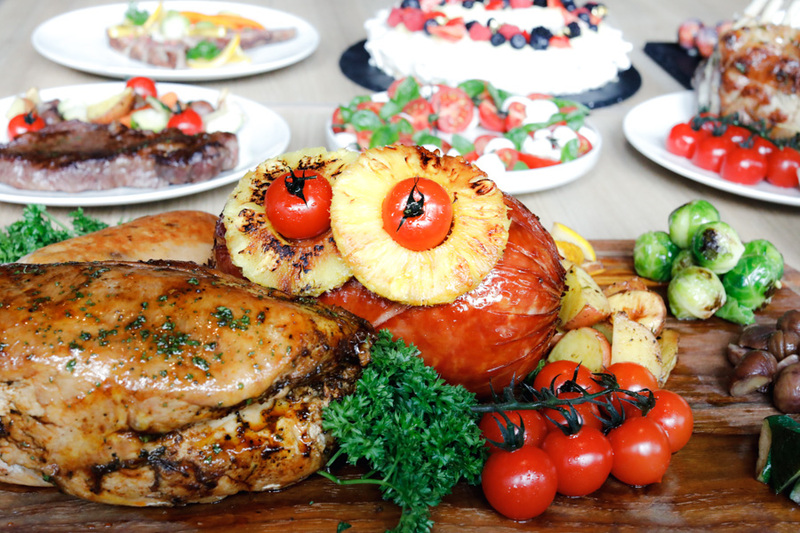 The Celebration Set ($138+) includes a 2kg Roasted Turkey Breast, 1.5kg Honey Baked Ham and a Trio of mini Log cakes, is ideal for group gatherings or mini-office parties. Roasted vegetables, chestnuts, pearl vine tomatoes, Brussel sprouts and specialty sauces are all included. Pre-order 3 days in advance.